The Key Lodge is in Old Town, surrounded by its celebrated charm. You can stroll to the Hemingway House in one direction, to the Atlantic Beach in the other. All the water sports, tourist attractions, art galleries, boutiques, theatres, bars, wonderful restaurants and night spots of Old Town Key West beckon to you â€“ all just moments from your front door. Once you have experienced the Old Town difference, youâ€™ll never stay elsewhere. And once you discover the comforts and congeniality of the Key Lodge, we believe weâ€™ll be seeing you again and again. Key Lodge will delight you with its many deluxe touches â€“and with a very special friendliness. 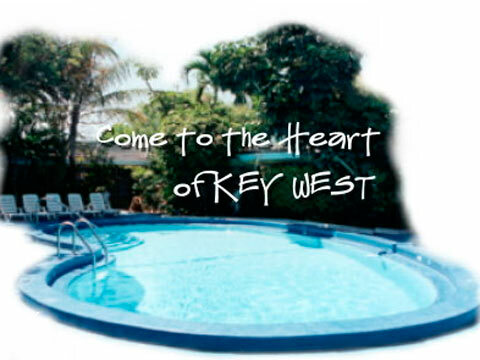 The 24-room Key Lodge, in fact, has gained remarkable popularity with visitors to Key West. Chat with your neighbors around the sparkling, heated pool â€“ youâ€™ll find very many of your fellow guests, typically, have stayed here before and fully intend to return to Key Lodge in future seasons. Key West America's Caribbean Island A tropical paradise with fabulous weather, exotic plants and flowers that grow wild, sunsets famous for their beauty and a historic district larger than most any city in Americaâ€¦ There's Something for Everyone... Historic sites, charming shops, great galleries and quiet beaches provide a wealth of entertainment. Nightlife is exciting with world class restaurants, lively discos, bars and theatre. Everything is within walking or biking distance from the Key Lodge.